artSMart: CAN YOU EVER FORGIVE ME? Towards the end of her life, writer Lee Israel said she was most proud of her work as a literary forger. “I was a better Dorothy Parker than Dorothy Parker ever was,” she claimed, concluding that her fake letters were “larky and fun and totally cool”. Can You Ever Forgive Me? (a line from one of the fake Dorothy Parker letters) tells us why she adopted this alternative career and what happened after that. As with many radical changes, her life of crime was born of failure. Her legitimate career, writing ho-hum biographies of stars such as Tallulah Bankhead and, less successfully, Estee Lauder, had ground to a halt. She had run out of money, couldn’t pay her bills and her agent wasn’t returning her calls. Then, rejecting the possibility of becoming a mere “wage slave” in some office, she discovered a way of making money by using her literary skills, forging letters purportedly written by celebrities such as Parker, Louise Brooks, Ernest Hemingway and Noel Coward. Initially, she was clever enough to make the letters witty, personal but not too earth-shattering, so that literary researchers weren’t alerted. The money started to trickle in and, slowly, life started to be fun again. The film’s great success is the casting of Melissa McCarthy as Israel. 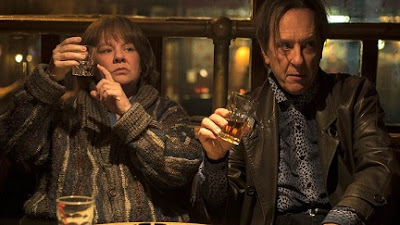 To be honest, I loathe McCarthy’s crude, straight-up comic roles and the films she normally appears in, but Can You Ever Forgive Me? is another beast entirely. Here, in this altogether more serious and substantial role, she is wonderful as a feisty, morose and not entirely likeable washed-up writer sinking into a slough of indebtedness. She hardly cracks a smile in the movie, but dark comedy goes handily with her increasingly wintry reflections about her situation. And she has the perfect partner in crime, Jack Hock (Grant), a gay opportunist fallen on hard times. They share a liking for booze (Israel is an alcoholic), sharp-edged chat and, ultimately, the thrill of the chase as they begin their collaboration. This is probably as close as Grant gets to his first notable role in movies in Withnail and I and he really makes it count. Beyond the main plot, Nicole Holofcener and Jeff Whitty’s script (based on Israel’s 2008 memoir) and Marielle Heller’s direction expose a deeper reality about the human condition, loneliness. Israel and Hock aren’t just conniving criminals but solitary people hoping to make a connection in a cold, unforgiving world. Israel, of course, is her own worst enemy in this regard, as she is almost allergic to intimacy, sharing her deepest feelings with her cat. This additional dimension gives the film a depth that goes well beyond the reach of a mere comedy.